We get to Day 9 of the 30 Day Tarot Challenge from Ree at 78 Keys (Day 8 was posted on December 19th) and the question for Day 9 is: What card do you pull the most often? Why do you think that is the case? You know, I have no idea! There are a few cards that hardly get pulled, but I haven’t been keeping a tally for 2012 as to the most popular pulled cards (or not) to find this out. I’m pretty sure it’s going to be from the Minor Arcana, if I were to sit down and work out that statistic. Why do I think that’s the case? Oh, now that’s a good question, without knowing what the card actually is! Well, I think it’s a Minor / Court and probably an Arrow or Stones, simply because those tag options are more prominent in the setting up of the blog post than the other suits of Wands and Vessels. And it’s probably more one of those two suits (Arrows or Stones) as I’m very much more a tactile and feeling person, than I am a logical doer. Okay, yes, I can do pretty much most things, but like everyone, there are things I’d rather not do with my life choices or every day living choices and there are things I prefer to do! Lets go for the Queen of Stones for now, shall we? Here she is above, just to remind us of the Mamma we all have within us. I think I get her and the Queen of Arrows a lot, to counter balance my own nature, which I feel is progressing nicely from the Knight to the Queen of Vessels (being the Pisces I am, I fit into the Knight of Vessels (Eel) very easily). So that is why I feel I get the Queen of Stones or Arrows perhaps more than the other cards, Minor, Court or otherwise. Even linking back to those 3 posts, the Queen of Vessels comes out more than the Queens of Arrows and Stones. Now, that is something of a surprise to me! More questions and answers from this list, tomorrow. Perhaps you manifest the emotional nurturing of the Queen of Vessels? I love the Queen of Stones in this deck. She’s raw and magnificent. I am fairly new to using the Tarot regularly – been delving into it more and more lately. 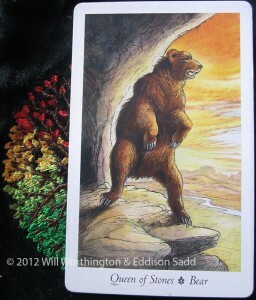 I have the Ryder Waite Deck and have pulled a LOT of Pentacles lately, usually 9 and 10. I am thinking that’s abundance coming my way? Nine and Ten yes, would be practical fulfilment, abundance, obtained all that you can. The trick now, is to switch, like on the Tree of Life, to a different arm and bring that up to the 9 and 10 status. Okay, you got me totally. I haven’t any idea what any of this means! Or how I relate to it or it to me. I know nothing of Tarot or what any of the cards mean. What I do know is that I just had my cards read in October and it was amazing what they said and how much they knew. Kind of blew my mind! A fascinating question. I have a Aquarian deck and a fairy deck. The Empress and King of Swords comes up quite a bit. Lots of knights, nines twos sevens. I often get two major arcana cards I shall have to pay closer attention. I am a novice but I love pulling out cards. thanks Louise for your insight. Very interesting. The Empress showed up this morning. with seven of pentacles and 8 of swords… more of the above I would imagine. Just letting it all fall into place. The 8 of Swords is about direct, high impact news and communication. Either giving it or receiving it or as is usual in 24 hours, a mixture of both! Hope that you have a good day! Seven of Pentacles is about harvesting or waiting for the funds to be available.